A month ago there's a good chance the name Usain Bolt meant nothing to you. Now? Well if you don't know the name now, I hope you enjoyed your time spend under the rock. The fastest man on the planet appears in his own online game. Developed by Puma the game captures the sprinters Olympic success and provides a very engaging, and somewhat addictive experience. 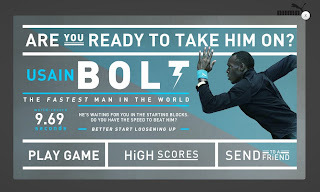 By the look of it, this is not a quick turnaround of an off-the-shelf game, as it’s fully video-ised with Bolt, who’s a Puma-sponsored athlete of course. Check it out!